Make your sandwich making experience even more special with this Special Gas Toaster. 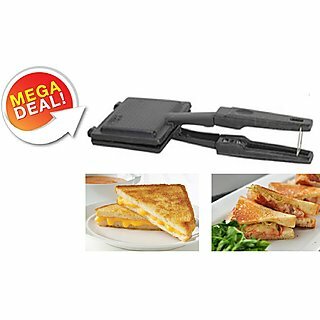 This Sandwich Toaster is one of its kinds with a non-stick coated heating surface. You will love the crispiness of the bread toasted in this toaster, which is completely hassle-free to use and non-stick. It comes with easy grip handle. Enjoy crispy & tasty toasts and sandwiches at any time With non stick coating inside Convenient handle locking system and Easy to clean convenient to use. It has heat resistant Bakelite Handle and No Electricity Needed. Hand crafted handle with maximum grip torque. Enjoy crispy & tasty toasts and sandwiches at any time with our handy gas toaster. Tired of eating plain, boring meals for lunch every day? Shopclues has a quick fix for you that is bound to make your office and school lunches better. Special aluminium gas griller. This inexpensive solution will make your ordinary lunches more appetising in just a few minutes. This user-friendly gas griller is made of aluminium and has a Teflon coating. This nonstick coating makes the griller easy to clean and reuse on a daily basis. The handles are long enough that there is no risk of burning your fingers.